Neely Coble Company is your landscape headquarters! We’ve carried the Isuzu product since its introduction to the United States in 1984 and are experts in designing the ideal landscape truck. With a variety of work ready trucks available at all times, the Isuzu NPR-HD Revolution is truly a revolutionary piece of equipment. 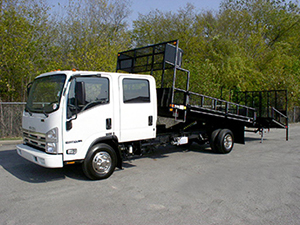 A 14,500lb GVWR truck with single and crew cab options, the Isuzu NPR-HD Revolution offers the versatility of three trucks in one! The remove-able dovetail & hoist provide all you need to switch between a landscape, flatbed and dump body in as little as five minutes.